An Excerpt from "Batu, Khan of the Golden Horde"
Minstrels sang of the feats of Alexander the Great in the squares of Italian towns. When Marco Polo wrote of his exploits in the service of the Great Khan, perhaps he thought that the minstrels might sing of him, a merchant of Venice who traveled the world in the service of the most powerful ruler on earth, but this was not to be. 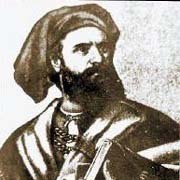 When Marco Polo published the account of his travels, his fellow Venetians branded him a liar and called him Marco Millions, Marco of the Million Lies. Marco left China because he had been homesick for Venice and wished to end his days in his native country. Before he left China, Khubilai Khan offered him a noble marriage and a position at court, an elevation from his status as a merchant. The Mongol Empire was a meritocracy and a low birth did not mean that prospects were limited. The greatest general in the army, the man who supported Batu Khan in the conquest of Russia, had begun in life as a herder of reindeer and the son of a blacksmith. Marco turned down riches and status. He missed his homeland and returned by sea to the Most Serene Venice. Marco began life as a merchant, employed in the emporium of his father and his brother. The Polo Brothers set off for China because they wanted to engage in the luxury goods of the China trade. The best way to make a profit was by eliminating the middlemen of the Middle East. On the way, they were forced to spend three years in Bukhara, a trading center, because of civil war among the khans. Marco learned the languages of the court and upon his arrival in China, spoke to the Khan in his own language. This was to prove a valuable skill. Marco was invited to be a personal envoy of the Khan and entered his service. He was rewarded with a salary and an elevation to the nobility, a rank he could not have attained in his native Venice. It is clear from the writings that Marco regarded Khubilai Khan as the greatest, wisest and most powerful man on earth. In Khubilai's splendid court at Shangdu in China, Khubilai Khan employed men of every nationality. It was international and cosmopolitan. The Khan was a great master of political theater, for his empire spanned much of the globe and he had to appeal to all of them. If later in life, the Great Khan had a tendency to paranoia, it was because he had enemies and few he could trust. Among them was his principal wife Chabi, his son the Heir Apparent Jinggim, his Tibetan lama, the great general Bayan, his Chinese chancellor Liu, and not least, Marco Polo. When he lost his friends and supporters later in life, he went into what can only be described as his Lear period. He was mad. Thus passes glory. A story of impermanence, a Buddhist theme. Read about it in my volume about Khubilai Khan, "Taifun." Marco was valuable to the Khan because as a European, Marco had not sided with any of the factions at court. In short, he was a good spy, a secret envoy, a loyal official reporting back on the various personalities who pursued their own interests, the Confucians, Buddhists from Central Asia and Tibet and the Muslims from Central Asia. The Mongol nobility was split into factions, some in favor of Khubilai's innovations and some members of his own family who thought he had become too influenced by the Chinese and had abandoned his heritage. Several of these went to war against him. The Pope of the Church of Rome wanted to convert all of Asia to Christianity. Khubilai Khan resisted and informed Marco that the only reason that he did not convert to Christianity was because the Mongol nobility who were shamanists would feel he had abandoned his heritage. Nothing was further from the truth. In his private life, Khubilai Khan was a true Mongol who hunted and performed the rituals of The Ancestors. It is true that he and his principal wife Chabi had converted to Buddhism because shamanism was not a religion for a sophisticated man. As a master of the symbols of political theater, he observed the ceremonies of the Confucians in the Temple of Heaven. After all, his was a conquest dynasty. The population of Mongols at the top of the empire was small. The vast majority of his subjects were Chinese and they had a professional class of administrators, the Confucians, who could rule China without an army. After they conspired and rebelled against him, he grew suspicious and never trusted them again. He refused to allow the civil service examinations because they were based on the Chinese classics. He would live to regret the error. Marco states that he believed that Khubilai Khan would have converted to Christianity, with the result that his barons and the common people following in time. Religion offered him a way to appeal to his subjects, but it could not be made a matter of political consequence. The public conversion to Christianity was not a possibility, even if it offered better relations with the Pope. The Pope was looking for an alliance with the Mongols against the Saracens of the Middle East, but I get ahead of my story. Marco was the first European to explore the Great Khan's empire. Marco’s own faith in God increased because he saw the world's variety. He spoke of trees: he had seen box trees in Georgia in Southern Russia, firs in Mongolia, palms in Persia--vast thickets of palms of immense variety-- and plantations of mulberry trees in China which are used in the manufacture of silk. The making of silk was a state secret in China. Marco fathomed the secrets of silk-making which was unknown in Europe. The Chinese kept it a closely guarded secret from all the world. Persia excels in the manufacture of cottons, damask, zandachi cloth, but only the Chinese have the luminescent and gossamer silk. Marco had seen immense forests around Xanadu, the vineyards of Kashgar and the bamboo forests of Tibet. He had also seen the garden of the Khan’s capital where he had trees brought from all over his Empire growing on a huge hill covered with malachite from Russia. The reason for this is that in the arboretum, the malachite ground is always green. The Saracens had monopolized the trade of spices, both aromatic and medicinal, from the Orient since ancient times. This they do by keeping from the merchants of Europe the true identity of the locations where these spices are grown, but Marco Polo was allowed to find the true sources of all these spices and made a report it to the Khan. One thing unknown in the West and a marvel of Cathay is a kind of fuel called coal which is black and compact. When ignited, it gives off, a heat, glowing bright red when it has reached its highest temperature and turning to gray ash when it has burned out. It is so abundant that in the public baths in China, anyone may have three hot baths a week. In winter, one could have a hot bath every day. The Chinese have risen to a much higher level of personal hygiene than the people of Venice. A hot bath in Italy is considered a great luxury to be enjoyed only by the nobility. In China, the common man is entitled to a hot bath. The Supreme Khan has founded a college of physicians at his court. There are hundreds of them practicing every type of medicine in the empire. They say that bathing is good for the health and recommended it to Marco who greatly enjoyed the custom. The nobility in China have private baths. If there were no other type of fuel other than wood, the forests of China would have long since disappeared. Only these coals will do. Marco Polo performed all the tasks that Khubilai Khan asked of him. He was young then. Had he had years and wisdom, he might have accomplished more. When he returned to his native land, he found that what he wrote of in the Khan's lands was not believed. He had been called a liar and asked to recant the stories he told. He proved that what I saw and heard was true because he recorded the places of origin of many commodities which Europe has only been able to acquire through the Saracen merchants. These places have not been known to Europe before so that any man who calls Marco a liar could have see for himself by reading the stamps on the crates of spices in European warehouses, when they have not been eradicated. But the citizens of Venice did not have the languages to read the crates and they did not believe him. They called him Marco Millions and laughed at him, but Marco Polo's book became the greatest travel book of all time. Even so, he was misunderstood in his time, among his own people. Perhaps at night, in his city of Venice, he took out the gold paizi, the emblem of his authority under the Khan, and wondered if he should have stayed in Khanbalik, as the Khan’s city was called. On those nights, perhaps a melancholy overtook him. To sweep away this heaviness of spirit, perhaps Marco lifted a glass of wine to him and offered a toast: “To Khubilai Khan, who understood the meaning of “the millions."